The unique tool for optimize the performance of your PC Keep your PC at peak performance with Black Bird Registry Cleaner! What Is a Registry Cleaner? Its purpose is to keep your Windows Registry tidy, efficient and help applications to run without a hitch. But What's the Registry? The Registry though, is just a kind of hierarchal database, storing varied information on the Operating System and installed components. Why you need to use Black Bird Registry Cleaner? Once your Registry has been cleaned up, you will likely notice a performance boost and any error messages you saw whilst using your computer previously will be gone. 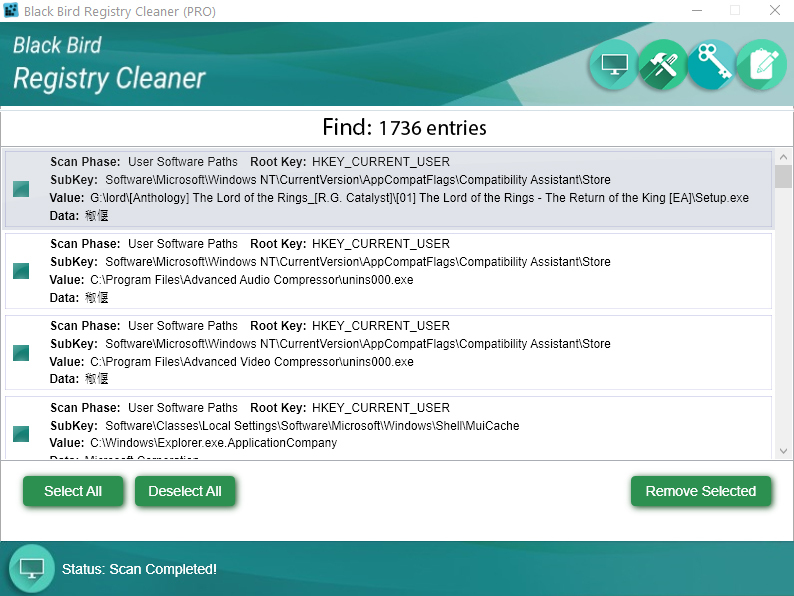 The Registry Cleaner will remove entries for non-existent applications, and it'll also fix invalid or corrupted entries. You find your computer starts much more quickly too! Keep your PC at peak performance with Black Bird Registry Cleaner! License Agreements/Shareware License Agreement This license agreement applies to Black Bird Cleaner software products that are marked as Shareware. By opening or de-archiving the shareware package and/or by using the software included with this agreement you accept the terms of this license. If you do not agree to the terms of this agreement, promptly stop using the software and erase all copies of the software in question.